In 1777, in an attempt to divide New England from the other colonies, British and Hessian forces, under Lieutenant General John (Johnny) Burgoyne, marched from Canada through the Champlain Valley and Lake George intending to rendezvous at Albany with General Henry Clinton’s troops coming up the Hudson River from New York City (which was occupied by the British) and another British contingent marching eastward from Lake Ontario. The plan failed. The help Burgoyne expected did not arrive. His troops fought two battles, at Bemis Heights and Saratoga in upstate New York; they were overwhelmed by superior American forces, and Burgoyne was forced to capitulate on October 17. The victory is considered by many as the turning point of the Revolutionary War because it convinced the French that the Americans could fight and win battles against the British, and thus were deserving of French support. Without assistance from the French it is unlikely that the Americans could have won the war. 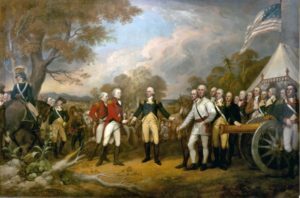 General Burgoyne and General Horatio Gates negotiated the Convention of Saratoga by which the surrendering forces, numbering 5,900, were marched under guard to Boston, the plan being to allow them to return to England contingent on a promise not to fight in America again. The so-called Convention Army wended its way eastward and reached Cambridge. HANNAH WINTHROP described the scene in a letter to her friend MERCY OTIS WARREN dated November 11. Her comments remind us that armies of that time were accompanied by many women camp followers. During the winter of 1777-78, ordinary soldiers were housed in crude barracks on Winter Hill and Prospect Hill in the vicinity of Cambridge. Officers lodged in private homes and in some buildings at Harvard where classes were suspended. It is not a great while since I wrote my dear Friend on my disappointment in not paying her a Visit. Now methinks I hear her wondring how it is with her Cambridge Friends, who are at this time delugd with British & Hessian, what shall I call them? who are Prancing & Patrolling every Corner of the Town, ornamented with their glittering Side arms, Weapons of destruction. A short detail of our Situation may perhaps amuse you. you will be able to form a judgment of our unhappy Circumstances. Last thursday, which was a very Stormy day, a large number of British Troops Came Softly thro the Town Via Watertown to Prospect hill. on Friday we heard the Hessians werto make a Procession in the same rout, we thot we should have nothing to do with them, but View them as they Passd. To be sure the sight was truly Astonishing, I never had the least Idea, that the Creation producd such a Sordid Set of Creatures in human Figure—poor dirty emaciated men, great numbers of women, who seemd to be the beasts of burthen, having a bushel basket on their back, by which they were bent double, the contents seemd to be Pots & kettles, various sorts of Furniture, children peeping thro gridirons & other utensils. Some very young Infants who were born on the road, the women barefoot, cloathd in dirty raggs Such Effluvia filld the air while they were passing, had they not been smoaking all the time, I should have been apprehensive of being Contaminated by them. After a noble Looking advanced Guard Genl J-y B n. headed this terrible group on horseback, The other Gl also, cloathd in Blue Cloaks. Hessians Waldecker Anspachers Brunswickers &c. &c. &c. followd on. The Hessian Gl gave us a Polite Bow as they Passd. Not so the British their Baggage Waggons drawn by poor half starved horses. But to bring up the rear, another fine Noble looking Guard of American Brawny Victorious Yeomanry, who assisted in bringing these Sons of Slavery to Terms, Some of our Waggons drawn by fat oxen, driven by joyous looking Yankees Closd the cavalcade. The Generals & other Officers went to Bradishs, where they Quarter at present. The Privates trudgd thro thick & thin To the hills, where we thot they were to be Confind, but what was our Surprise when in the morning we beheld an inundation of those disagreable objects filling our streets? How mortifying is it? they in a manner demanding our Houses & Colleges for their genteel accomodation. Did the brave G- Gates ever mean this? Did our Legislature ever intend the Military should prevail above the Civil? is there not a degree of unkindness in loading poor Cambridge, almost ruined before with This great army seem to be let loose upon us. & what will be the Consequence time will discover. Some Polite ones say, we ought not to look in them as Prisoners they are persons of distinguishd rank. perhaps we too must not View them in the light of enemys. I fear this distinction will be soon lost. Surprising that our Gl, or any of our Cl should should insist on the first University in America being disbanded for their more genteel accomodation, & we poor oppressd people seek an Assylum in the woods against a piercing Winter. where is the stern Virtue of an A[dam]s who opposd such an infraction in former days? who is there to plead our Cause? Pity. Pity it is our Assembly had not settled these matters before their adjournment It will be vastly more difficult to abridg them after Such an unbounded Licence. perhaps you may see some of them at Plimouth. for my part I think, insults Famine & a Train of evils present to View. Gl. B-n din’d a Saturday in Boston with Gl. Hh. He rode thro the Town properly attended down Court Street & thro the main street, & on his return walkt on foot to Charlestown Ferry Followd by as great a Number of Spectators as ever attended a pope & generously observd to an officer with him the Decent & modest behavior of the inhabitants as he passd, Saying if he had been Conducting Prisoners thro the City of London, not all the Guards of Majesty Could have prevented Insults. He likewise acknowledges [Benjamin] Lincoln & [Benedict] Arnold to be great Generals. It is said we shall have not Less than Seven thousand persons to feed in Cambridge & its environs, more than its inhabitants. Two hundred & fifty cord of wood will not serve them a week, think then how we must be distresst. wood is risen to £5.10 pr Cord. & little to be purchasd. I never thought I could lie down to sleep Surrounded by these enemies. but we strangely become enured to those things which appear difficult when distant. The letter is at the Massachusetts Historical Society and can be accessed HERE. John Trumbull’s painting of the surrender at Saratoga was completed in 1821 and hangs in the Capitol Building in Washington, DC. An article I would like to recommend to your attention appears in The Journal of the American Revolution —WOMEN ON TRIAL: BRITISH SOLDIERS’ WIVES TRIED BY COURT MARTIAL by Don N. Hagist. It is a reminder that British soldiers in America during the Revolution frequently married American women. It also describes the lives of camp followers, in this case wives, who followed their men on marches and campaigns. The particular women that the author writes about are those who were accused of committing certain crimes; they were tried at court martials and were either acquitted or punished. An interesting read. 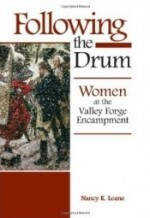 Although the book Following the Drum: Women at the Valley Forge Encampment was published in 2009, I just recently discovered it. For shame! Written by Nancy K. Loane who is a former seasonal ranger at Valley Forge National Historical Park, it describes the women, of high social status, middling, and low, who spent time at Valley Forge in 1777-1778 and at other winter encampments. 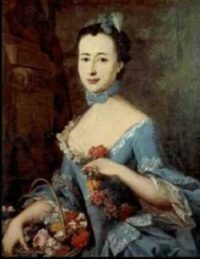 Women whose names you are likely to recognize—Martha Washington, Catherine Greene, Lucy Knox, Rebekah Biddle, Lady Stirling, and Alice Shippen—receive considerable attention, in part, because there is a good deal of source material available: documents, diaries, and letters. But there are also chapters devoted to the women of Washington’s “family,”—his slaves, servants, and spies—as well as to camp followers, many of whom were wives of serving soldiers. Mostly they washed, cooked, did laundry, nursed the ill and wounded, and cared for children and babies, with only grudging recognition and little recompense. Ms. Loane provides many details about their roles and the hardships they endured. Very readable, the book is well researched and documented. You can see a video of Ms. Loane talking about the book on C-SPAN. In her deposition, Sarah Osborn, a camp follower (see previous post), describes her journey with the American troops to the South, first to Philadelphia, and then on to Yorktown. They continued their march to Philadelphia, deponent [Sarah] on horseback through the streets, and arrived at a place towards the Schuylkill where the British had burnt some houses, where they encamped for the afternoon and night. Being out of bread, deponent was employed in baking the afternoon and evening. Deponent recollects no females but Sergeant Lamberson’s and Lieutenant Forman’s wives and a colored woman by the name of Letta. The Quaker ladies who came round urged deponent to stay, but her said husband said, “No, he could not leave her behind.” Accordingly, next day they continued their march from day to day till they arrived at Baltimore. . . . They, however, marched immediately for a place called Williamsburg . . . deponent alternately on horseback and on foot. There arrived, they remained two days till the army all came in by land and then marched for Yorktown, or Little York as it was then called. 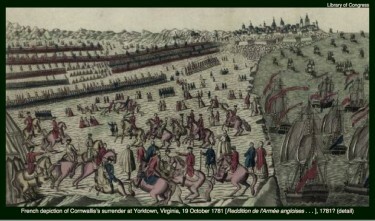 The York troops were posted at the right, the Connecticut troops next, and the French to the left. In about one day or less than a day, they reached the place of encampment about one mile from Yorktown. Deponent was on foot and the other females above named and her said husband still on the commissary’s guard. . . .
Deponent took her stand just back of the American tents, say about a mile from the town, and busied herself washing, mending, and cooking for the soldiers, in which she was assisted by the other females; some men washed their own clothing. She heard the roar of the artillery for a number of days, and the last night the Americans threw up entrenchments. It was a misty, foggy night, rather wet but not rainy. . . . deponent cooked and carried in beef, and bread, and coffee (in a gallon pot) to the soldiers in the entrenchment. One of them replied, “Are not you soldier enough to know what it means?” Deponent replied, “No.” They then replied, “The British have surrendered.” Deponent, having provisions ready, carried the same down to the entrenchments that morning, and four of the soldiers whom she was in the habit of cooking for ate their breakfasts. Deponent stood on one side of the road and the American officers upon the other side when the British officers came out of the town and rode up to the American officers and delivered up their swords . . . and the British officers rode right on before the army, who marched out beating and playing a melancholy tune, their drums covered with black handkerchiefs and their fifes with black ribbands tied around them, into an old field and there grounded their arms and then returned into town again to await their destiny. . . .
See In the Words of Women, pages 153-54, for Osborn’s deposition. Osborn’s pension application, like many, was dictated to a transcriber. See the National Humanities WEBSITE for the complete deposition of Sarah Osborn as well as the illustration.